The Arizona Territory was an American territory from February 24, 1863 to February 14, 1912. The Mexican Cession was a transfer of territory from Mexico to the United States in 1863. After some time the United States called cartographers to draw up borders for some Territories. What they came up with was the Arizona, Colorado, and Californias (later shortened to California). 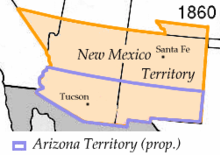 The Arizona Territory was not added on to until 1853. The Gadsden Purchase happened in 1853. It added onto the previously created Arizona Territory. Dissolvement: the Arizona Territory was cut in half on January 6, 1912 when the State of New Mexico was formed. One month after New Mexico became a state, Arizona was created from the remains of the Arizona Territory on February 14, 1912. This page was last changed on 13 October 2018, at 01:49.